A pleasant surprise this morning to find that the fourth egg has hatched to give us a full brood. Even when the adults leave the platform, as they are now doing especially around feeds, it can be hard to count the chicks. However, the female was also seen eating eggshell again this morning, presumably of the fourth egg as no other chunks of shell were visible last night, and when they are being fed the four can be seen clearly – at times. The female is doing the feeding, and did a great job of ensuring that all four chicks were fed at the session captured above. 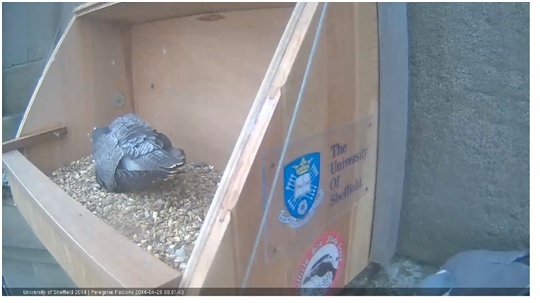 She is also taking the night-time brooding duties, and this evening did very well to shelter the chicks from a torrential downpour over Sheffield. All seems to be well despite the exceptionally heavy rain and she’s keeping alert into the night. Last year two eggs hatched together in the afternoon of 5 May, with a third hatching fairly early the following morning. So we’re a week ahead of last year, possibly a response to the generally mild weather through January and February. But it looks as if the outcome of the clutch may be the same, with three of four hatching. Last year the fourth egg failed to hatch as it was punctured by the male’s talons when he arrived at the nest on one occasion. Whether or not this has been the case again will be very hard to determine, but there’s still hope that it may hatch. The norm is for eggs to hatch at roughly the same time, but there can be a gap of up to several days. Food was first brought to the nest (by the male) when only one egg had hatched, but within a few hours of the second and third chicks hatching within minutes of each other two food items had been brought in. First was a Coot – an unusual prey species – though this was not fed to the chicks, as below. Shortly after this what looked like a Feral Pigeon was brought in and fed in tiny pieces to the three chicks – their first feed. 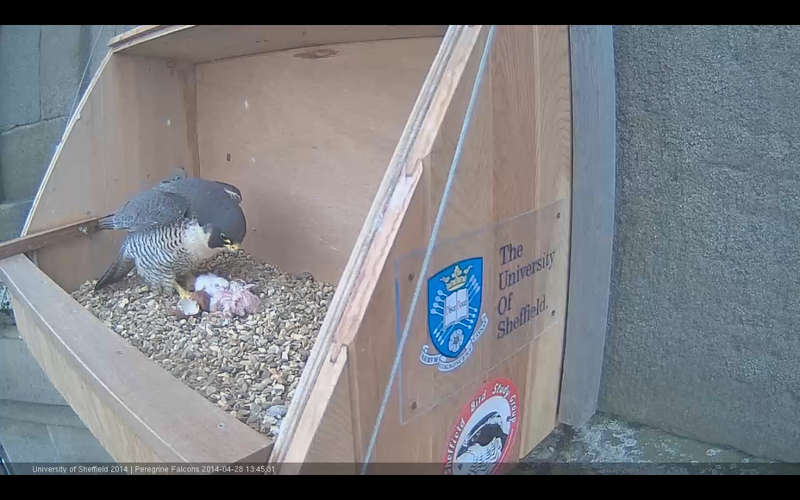 At least one feed took place today, with all three chicks feeding well, as below. Andy D sent me a screengrab of the female eating eggshell earlier today, interesting behaviour that is apparently routine but rarely seen. Something else that is out of the ordinary that was captured on camera yesterday was the appearance of a Woodpigeon near the nest. I could hear it singing loudly and thought it had to be pretty close to the webcam, and it then appeared in view right at the side of the next platform! It didn’t jump onto the box or peep over the side, but the curiosity Woodpigeons have shown in the platform on a couple of occasions now is pretty surprising, and decidedly risky. At present the female continues to incubate the fourth egg and brood the three chicks overnight, though it’s the male arriving in the picture above and he continues to incubate/ brood. Last year the fourth egg continued to be incubated for around a week after the other eggs hatched, and the adult continued to turn it and pull it under their breast for a good four-five days, though it was increasingly pushed aside as the chicks grew and space under the brooding adult became less and less. And today’s Peregrine fact? I’ve prepared quite a few that can be found under the ‘Peregrine FAQ’ tab on the top menu above and hope they give food for thought. Topical for tonight is an average UK clutch size of 3.65 over a long period compared to the average fledged brood size of 2.57 young. 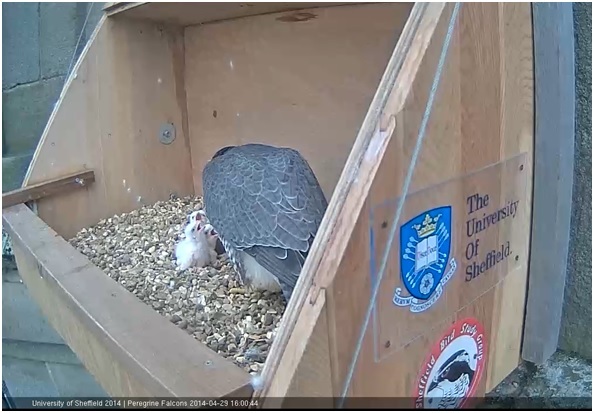 No doubt David will be on hand shortly with a more detailed post, but the big news this morning is we have our first chick! 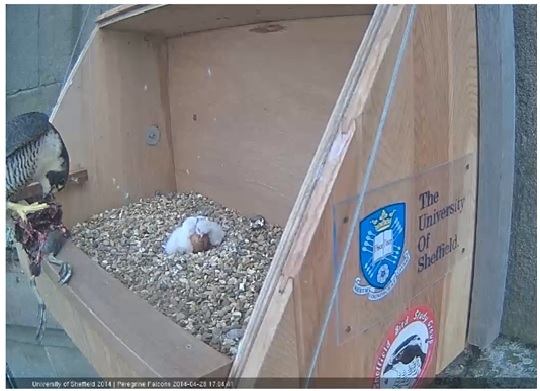 Judging from the comments to the blog, some of you early birds spotted it at around 5am this morning – hopefully we’ll be able to have a look through webcam footage for the exact time. 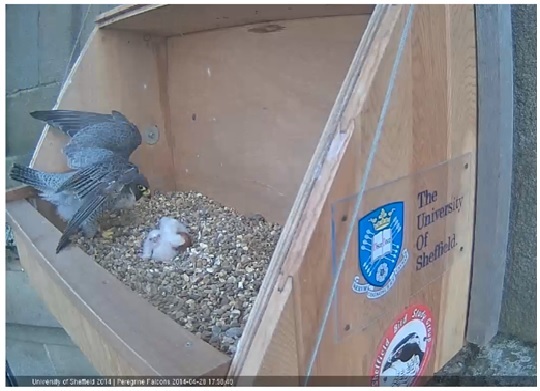 So the excitement starts again – keep your eyes peeled on the webcam to watch the events unfold live, and follow the University’s Twitter feed and this blog for further announcements. Also, if you’re on Facebook we’ll also be posting regular updates the SBSG’s Facebook page. EDIT – By the end of the afternoon I’m sure most of you have noticed… we now have three! Cheeping sounds were reported as heard around midday, thought to be coming from the eggs. No sign on any chicks, but there is definite pitting of the shell, visible as a pale patch with the outer shell broken off in the picture below. In case it’s not very clear, it’s on the darker egg to the right, on the top left-hand corner. By dusk this evening, the female was sitting tight, allowing occasional glimpses of the four eggs, with the pale patch visible and no larger. 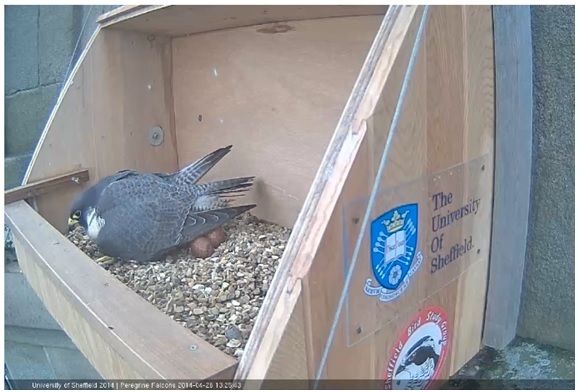 Here in the picture above it’s on the egg to the front left, which she’s looking at and then turned over with her bill before settling back down to incubate. Could be a cracking day tomorrow, and I promise that’s the last of the egg-related puns. Various messages express the disappointment with the down-time of the webcam this morning, following a similar outage on Thursday as the University undertook maintenance on servers. Today’s problem seemed likely to keep us on tenterhooks for the weekend, but a fantastic effort by Ian Knowles and the CICS team has resolved the issues, conscious that this weekend is a crucial period. I’m far from an expert on such matters, but Andy D tells me that he’s managed to overcome problems with viewing the webcam on android devices by installing (free) Photon browser that supports Flash. No doubt there will be other ways of doing this, and other browsers are available! Thirty days after the clutch was completed we’re in the midst of the range of dates when the eggs are expected to hatch, with Monday at the outer end of the spectrum. 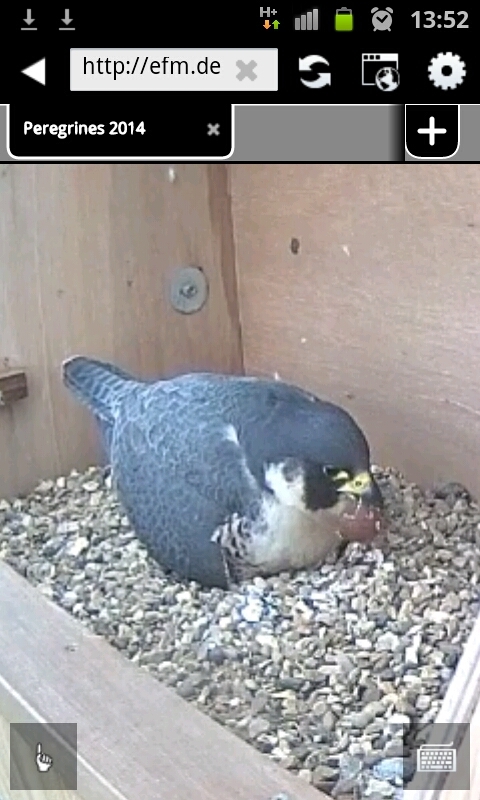 No sign of hatching today as both adults take turns to incubate, the male still reluctant to leave the eggs at times when the female arrives, and again doing around half the time on the eggs, ring visible as he arrives below. Since commenting on the male standing on one of the eggs, it’s been noticeable that the female is careful to avoid doing so, holding her foot closed and dangling – a bit as the male is doing in the picture above – as she settles. Her greater weight (950-1300 grams for an adult female compared to 600-800 grams for adult male) would no doubt increase the risk of damage to the eggs should she stand on one, but it’s hard to know if there’s a gender difference in behaviour here. 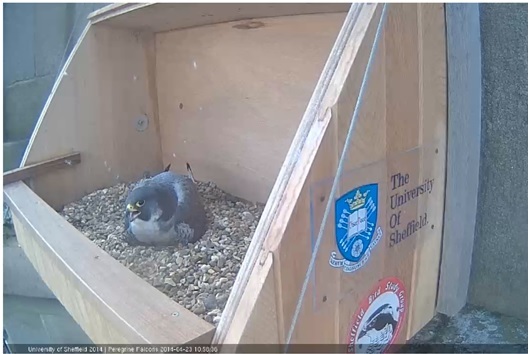 One change I’ve seen today was the female being less assiduous in her incubation duties, pecking at stones in the corner of the box and leaving the eggs exposed. Could this indicate that she has heard movement or cheeping from the eggs and knows hatching is imminent? 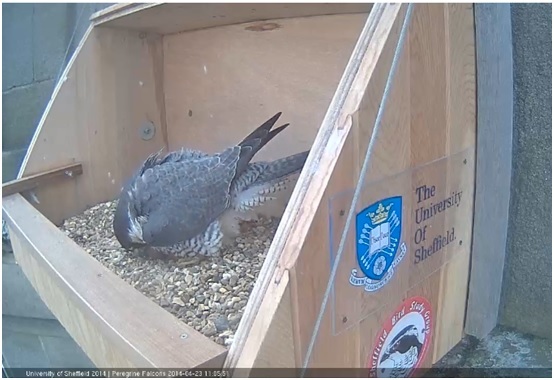 The periods when the eggs are left uncovered are a little longer than they have been in recent days and weeks, another possible indication that behaviour is changing slightly. Or perhaps I’m reading too much into things! 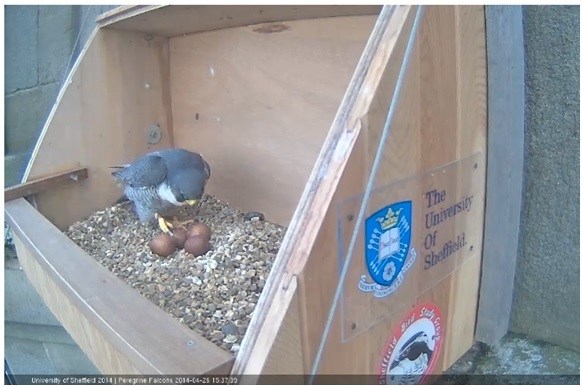 With today likely to be one of the last chances to see the eggs, a comparison above shows how they have faded over the past month, which is typical as they are rubbed by the adults’ feathers. 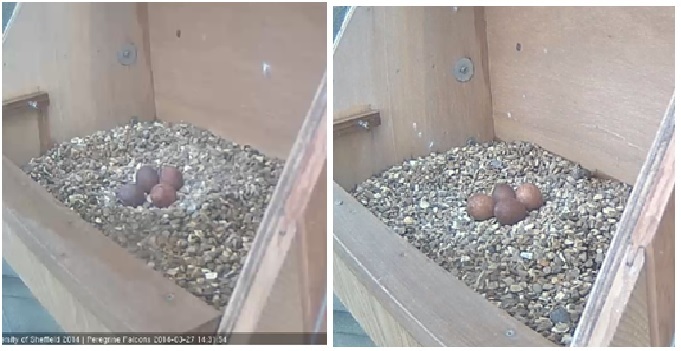 On the left above is the clutch on 27 March, the day the fourth egg was laid, while on the right is a picture from today. Apart from seeing that the darker and lighter pairs of eggs have both faded roughly equal amounts, it’s also interesting to note that they’ve changed position in relation to each other, no surprise given the amount of turning and shuffling that’s taken place over the last few weeks. 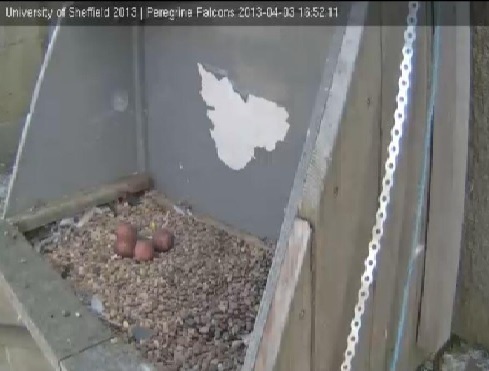 I’ve read that not only do Peregrines tend to lay the same number of eggs from one year to the next, but that the eggs themselves can be quite distinctive between females. Not sure if that’s the case with this female: this image of the recently completed clutch from last spring does look to have two eggs a little darker than the others. 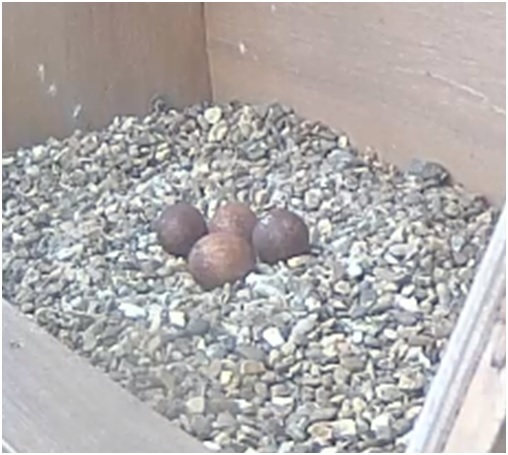 It’s just occurred to me looking at this that the eggs have been laid and incubated in a very similar position within the platform to last year, and it’s reminded me of what a terrific platform we have this year. Enough of the eggs, but I thought it was worth reflecting a little on them as we hope to move on to the next stage, perhaps tomorrow! 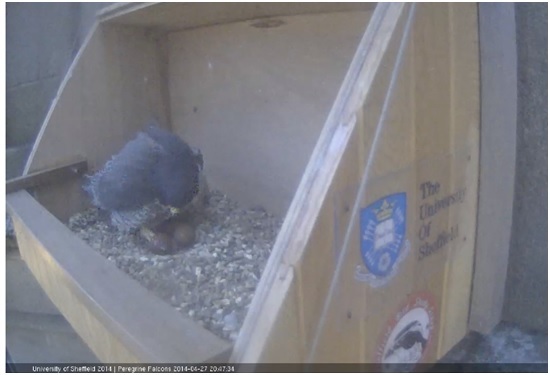 Finally, Peregrine fact of the day: the hatching of all eggs at roughly the same time (synchronous hatching) is taken as an indication that food supply is not a limiting factor for Peregrines and reduces sibling rivalry. Well, 27 days after the clutch was completed the hatching date is imminent. 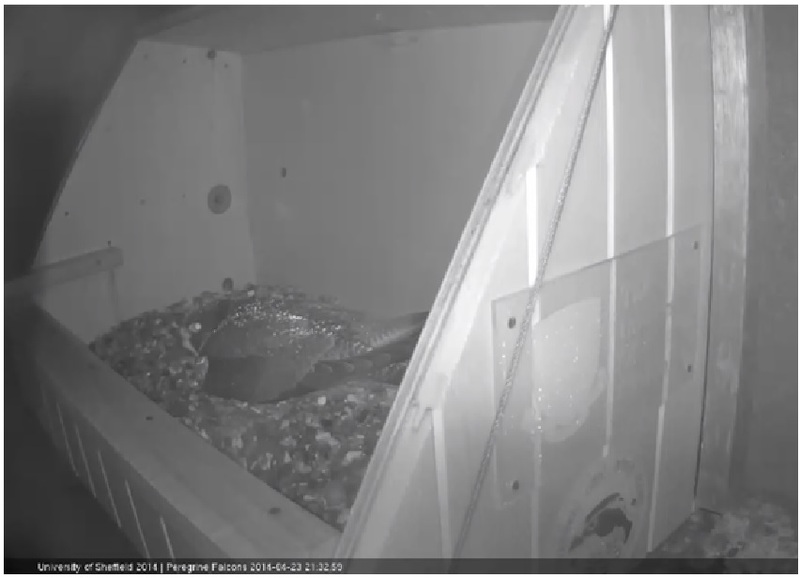 A range of 29-32 days is normal for incubation, though 28-33 is possible, so tomorrow would be the earliest potential date we could see the eggs hatch. Both adults are continuing to take turns on the eggs, the male showing little sign of the reduction in duties that the literature suggests. He became very animated at one point this morning, calling repeatedly, as in the picture above. I rushed across my building to see if a large raptor was moving overhead but there was nothing in sight, at least not to my eyes! Shortly after this he came off the eggs but remained on the edge of the platform, and then hopped onto the perching post, where he couldn’t be seen but his calls could still be heard. 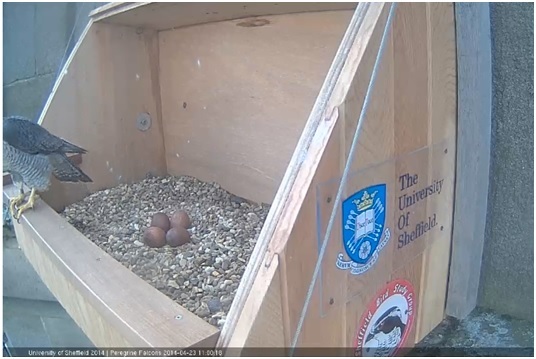 Apparently, eggs can be left unincubated for up to a couple of hours in good spring weather conditions, which answers one of the questions someone asked after the eggs were left uncovered for 20 minutes the other day. 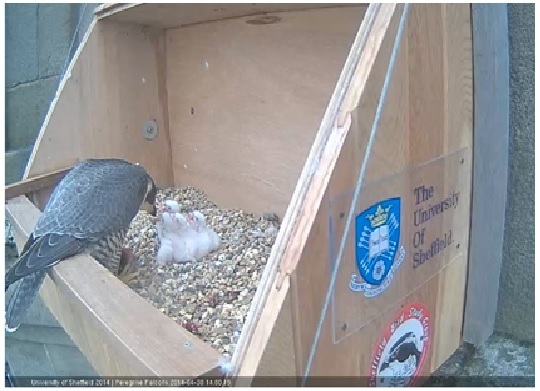 This time, however, it was only a few minutes until the female arrived to take over and showed they continue to turn the eggs, which perhaps indicates that they are not quite ready to hatch just yet. 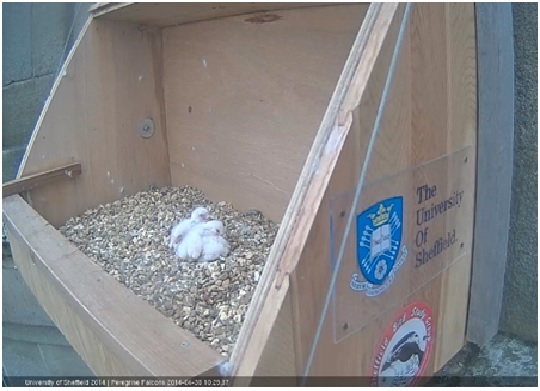 Once the chicks are ready to hatch, they can start to cheep at least 48 hours before they actually emerge, so it’s worth having the volume up on the webcam! In response to this and to movement of the chicks within the shell the female can become much more agitated and aggressive at the nest, so it’s also worth keeping watch for any changes in behaviour in the adults that may be the first signs of hatching. 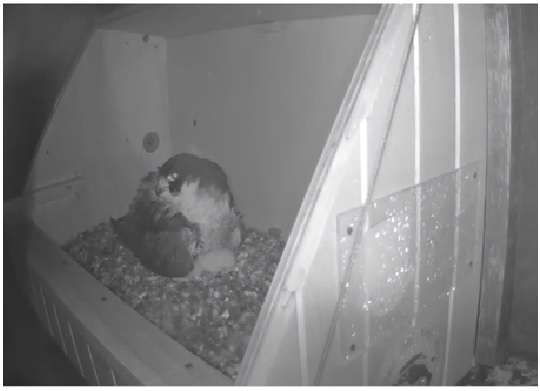 Exciting times ahead, but for now the routine of incubation continues, with good protection from tonight’s light rain being offered, looking as if it’s the male that’s providing it. 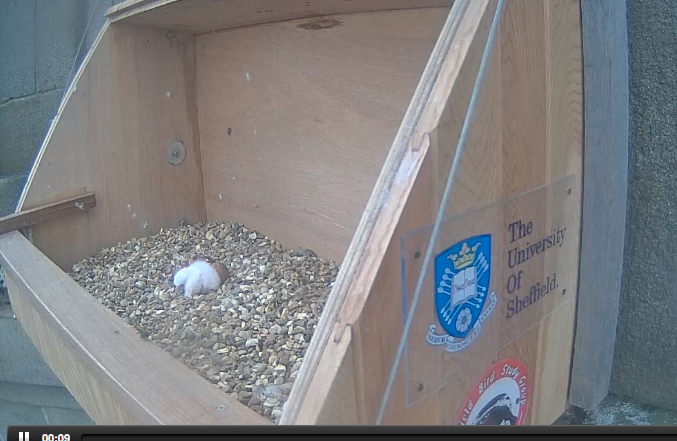 With 20 days now passed since the final egg was laid, we’re about two thirds of the way through incubation. 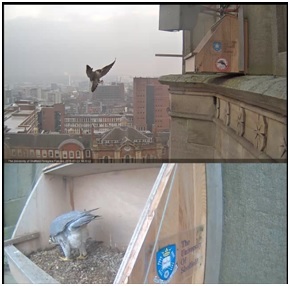 With work on the security lighting at St George’s completed without undue disturbance of the pair they continue to sit quietly, both male and female sharing duties and barely leaving the eggs uncovered for more than a minute between them. There is far less calling than was the case during courtship and when the eggs were being laid, though the male did call quietly to the female from the ledge round the corner when I went down at the weekend, apparently looking to encourage her off the eggs so that he could take over. 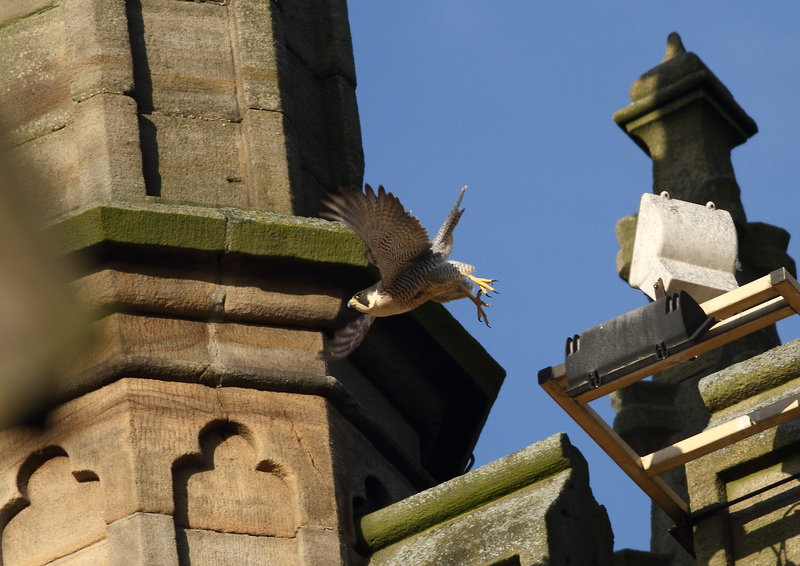 A little later she was on the high-level lights on the E side, where both adults are spending a fair amount of time, perhaps enjoying the early morning sun that falls on that side of the building, especially with the cold night-time temperatures recently. In the picture above she has just left the light, heading off towards the city centre. 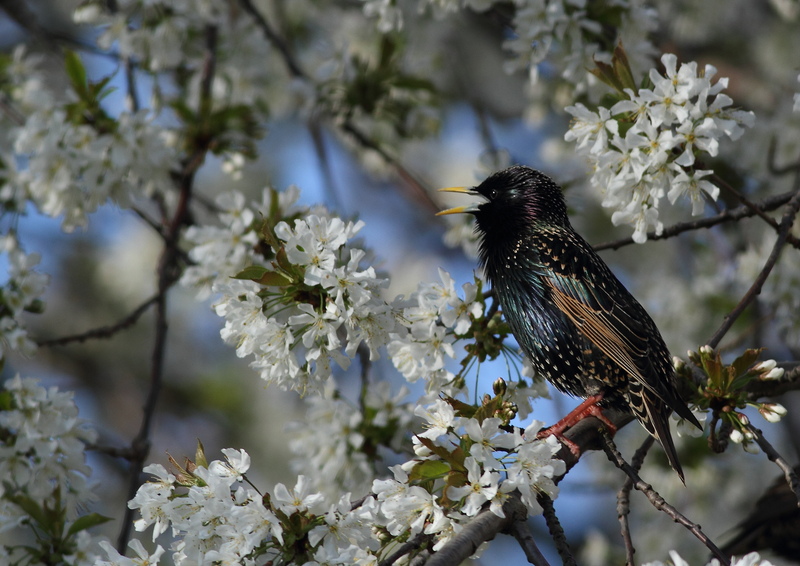 With the Peregrines generally inactive, it’s a good time to notice other breeding species around the church, with Starlings prominent as they feed on the short grass before flying up to their nests in stonework ornaments of the university buildings nearby. 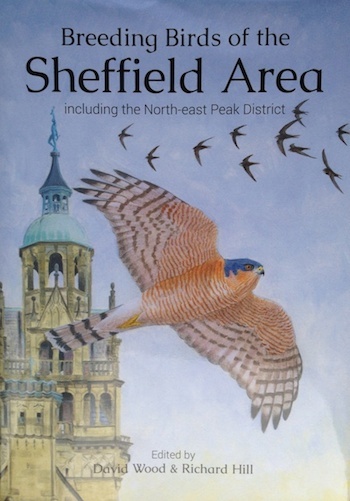 In response to my post about the third – immature – bird that has been around on occasion, Andy D replied to say that he’d seen an immature over Sheffield in Feb-March that was to all intents and purposes still in juvenile plumage, far less advanced than the bird in my (not very good) photo. A bit of reading up on this suggests that both stages of plumage would be possible in a bird from last year’s clutch! There is much variation in the timing of the first moult of juveniles: some begin their first moult in the March after they hatched (so aged 10-11 months) while others may not have moulted by December (so aged 20-21 months). And JLS notes that many species of birds feel where the eggs are in the nest when moving onto them. Unable to see the eggs as they lie under their body, the feet may act as a good way of locating the eggs before settling down onto them in such a manner as to engage the brood patch. Finally, a Peregrine fact to share after some extensive reading: the first British record of breeding on an occupied building dates from 1864 or 1865, when a pair reared young on Salisbury Cathedral.